I wasn't going to submit this project as I wasn't completely happy with it, but non the less I will share. In my wifes family the dollar dance is typically tradition, but we of course had to go against tradition. My wife and I met bar tending, so we decided that's what we would do. It was a lot of fun behind the bar and it was a great way to see everyone. So the box. It is made from the same old cedar fence the rest of our wedding builds were made from. I send these boards through the planner until all the old came off and it was brought back to life. I ran a edge through my router to clean it up and squared it on my table saw. I then cut the miters using my sliding miter saw. From there I put in two dado's on the boards with my router table, one for the back and one for the glass front. I then took one piece and cut the dado off so it could slide freely in and out of the dado. I attached the glass to this piece using silicon caulk. Apply a coat of finish and had a friend write on the glass "Honeymoon fund". Heated up the branding iron and made my mark. Turned out pretty good, and it was a TON of fun. Ok, @sawdust&beer. This one makes us have to ask...Where was our invitation?!? 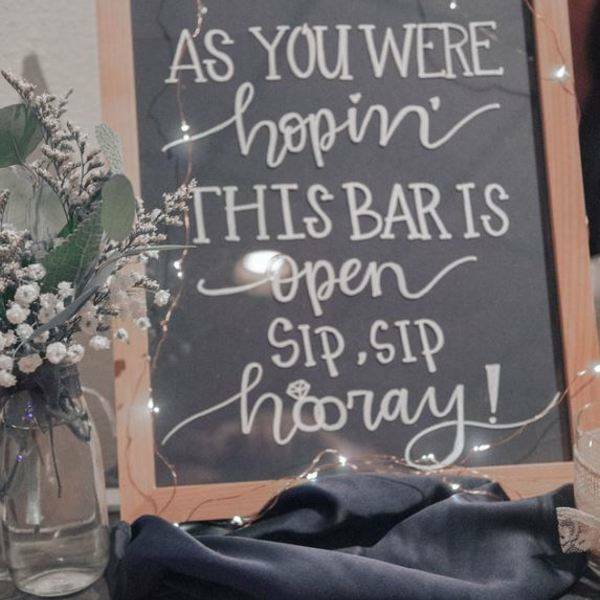 Your wedding looks like so much fun! Congratulations, again! Thanks guys! It was so much fun! I wasn't going to submit this project as I wasn't completely happy with it, but non the less I will share. 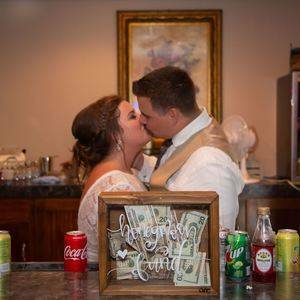 In my wifes family the dollar dance is typically tradition, but we of course had to go against tradition. My wife and I met bar tending, so we decided that's what we would do. It was a lot of fun behind the bar and it was a great way to see everyone. So the box. It is made from the same old cedar fence the rest of our wedding builds were made from. I send these boards through the planner until all the old came off and it was brought back to life. I ran a edge through my router to clean it up and squared it on my table saw. I then cut the miters using my sliding miter saw. From there I put in two dado's on the boards with my router table, one for the back and one for the glass front. I then took one piece and cut the dado off so it could slide freely in and out of the dado. I attached the glass to this piece using silicon caulk. Apply a coat of finish and had a friend write on the glass "Honeymoon fund". Heated up the branding iron and made my mark. Turned out pretty good, and it was a TON of fun.